Spring Break in Birmingham is finally here (even though the weather may be a tad confused). We have narrowed down a few of our favorite things to do this week while the kids are out of school. No beach plans? No problem! Birmingham has a lot of activities for the whole family to enjoy without having to get out of town. Disney’s The Lion King is fun for the whole family! Experience the broadway musical that brings a Disney classic to life! There are many showings now through April 1st. You don’t want to miss this fun filled show! To see a list of showtimes and to get your tickets, click HERE. Spring is in the air at the Mcwane Science Center! Grab the family and head over to enjoy new exhibits and new featured movies. There will also be an Egg Drop Saturday, March 31st where you are able to build your own device to help protect an egg from a 45 foot drop! 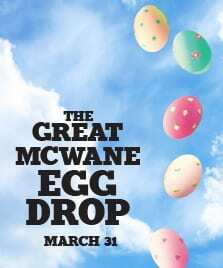 There will be two different chances to participate in the egg drop. Check the website HERE for times! 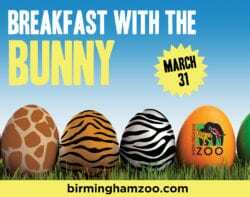 The Easter Bunny is coming to the Birmingham Zoo for breakfast at 7:30am and 9:00am on Saturday,March 31! Enjoy breakfast at the Zoo’s newest restaurant, Nourish 205. After breakfast, stick around for an Easter egg hunt! Tickets for breakfast are $30.00-Adults, $25.00-Kids for non-members and $25.00-Adults, $20.00-Kids for members. Ticket price includes Zoo admission for the day, Unlimited Ride Wristband, breakfast, activities and a visit with the Easter Bunny. Get your tickets HERE! 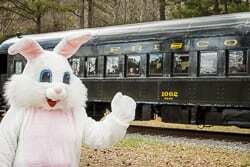 Hop aboard the Cottontail Express for a ride to Peter Cottontail’s meadow! Join in the fun at the meadow as we hunt for Easter eggs. A bounce house, temporary tattoos, coloring station, and a sandbox provide lots of family fun. Bring your camera to take photos with Peter Cottontail! There is only one ride left this Saturday, March 31st so get your tickets! You can buy them HERE!